Welcome to Malekula, the second largest island of Vanuatu situated in the South Pacific. More than a century ago cannibalism was still in practice on the island, but only as a means of defense and not as a source of food. Its inhabitants lived off the land whilst preserving its natural resources. Let's discover their world, from the natural materials they use for rituals to the preparation of their indigenous veganism meals, specifically their traditional dish the lap-lap. Vanuatu consists of 80 islands (twenty of which are uninhabited) and is one of the last remaining earthly paradises, renowned for its beauty and the spiritual and ancestral strength of its people. The Ni-Vanuatu from Melanesia, (a sub-region of Oceania in the Pacific Ocean) are comprised of 160,000 people who speak more than 100 dialects, including a common language called Bislama. Due to the country's history of colonization under Franco-English dominion for 80 years, English and French are widely spoken. 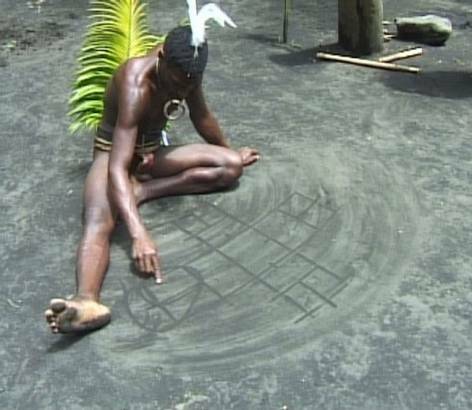 However, the Ni-Vanuatu's own cultural heritage has been preserved through an original and complex tradition of drawings on the sand. These drawings aren't just an indigenous artistic expression but are actually an intricate form of text that consists of various geometric patterns used for storytelling to communicate and convey different messages. 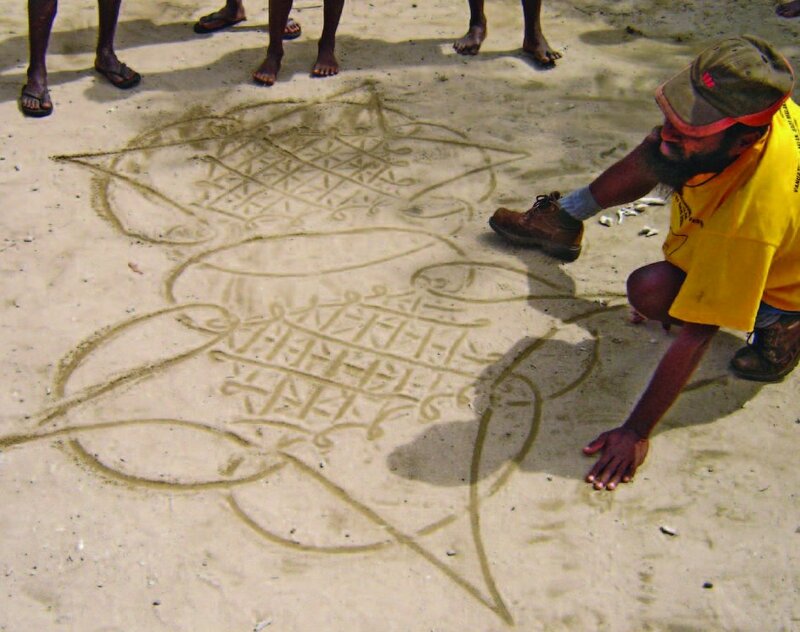 In 2008 the Vanuatu sand drawing texts were listed on UNESCO's Representative List of the Intangible Cultural Heritage of Humanity. The name Vanuatu means "the standing people" in Bislama, a name given to the archipelago by the Ni-Vanuatu at the end of the colonial period. In the world of geology, it is referred to as the "islands of ash and coral". Since the restoration of their Independence in 1980, the people have been striving to preserve their rites and traditions and sometimes even seek out older ancestral rites that are no longer practiced in order to affirm their lost identity and preserve the magnificence of their land. The Ni-Vanuatu are animists who believe that the spirit of their ancestors is present in the entrails of their volcanic soil and that hidden in the depths of the bubbling earth, their high-drilled drums exude the sounds of true prayers and odes to nature. They know that because of their geological position they are doomed to disappear from the planet in the next decade due to the land degradation caused by El Ninos and so their lives are devoted to the quest for the absolute essence of life. This specific region of the Pacific is full of natural vegetation that can provide a balanced diet without having to use animal-derived foods. The vast number of coconut trees, pandanus, and long banana leaves are all examples of the islands rich plant-based diversity. Lap-lap leaves, now common in Africa, Asia and Oceania, originate from Vanuatu. They are necessary for the preparation of most meals. These leaves come from a plant called "heliconia" and look like banana leaves. 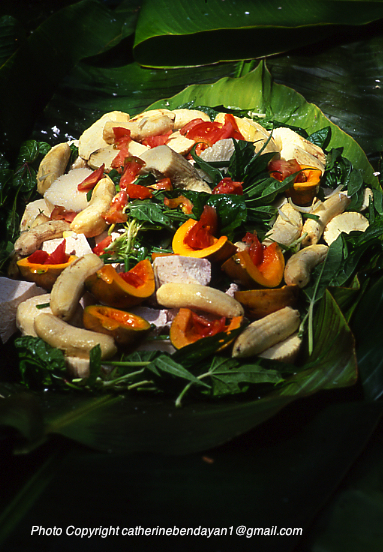 Their indigenou veganism diet consists of sweet potatoes, yams, tarots, cassava, pumpkins and varieties of spinach leaves, tomatoes, citrus fruits, onions, and bananas, all of which are found in abundance and only natural materials are used for the preparation of their dishes. The same is true for their masks, costumes, boxes, and objects of everyday life. Before preparing and cooking food, lap-lap leaves must go through a process of slight dehydration by being passed over a flame to reduce the moisture. This movement must be a quick and precise gesture in order to avoid scorching the leaves. The veins of the leaves are used to fold them, and once wrapped around the food the packages are placed on traditional ovens made of hot stones. Not a day goes by without the village chief initiating a ritual or a dance in honor of a designated ancestor. Before the harvest, men must sleep alone, without their wives. The lap-lap also serves to cover their intimate parts. Each ceremony has a specific meal to call upon the spirit of the ancestor, whose role is to honor the nourishing earth and the animal world (the importance of which our planet;s dominant cultures seem to have forgotten). The ni-Vanuatu bequeaths us a primordial heritage - that of the respect of nature. We should observe their traditions in order to recover our own, and replant the seeds of the earth's original resources and inidgenous veganism. Must they disappear in order for us learn this lesson? They have left lessons for us written in their volcanic soil while stamping with their toe-bells in order to make sure that we hear their message. The symbolism of natural food forces the construction of new digestive tracts whose traces of balance between modernity and tradition must be established.